I’ve been working on an area in my garden which I hope will become a very relaxing space. I would love for it to have a small Zen garden in it, perhaps I will finally make that happen next spring. Meanwhile, I was pleasantly surprised to discover several rounded and flat little stones along one of my hikes this fall. 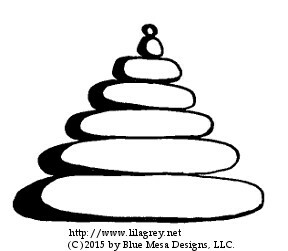 I collected several sizes, and I hope to make two or three stacks of stones in my Zen garden. Below is a small illustration that was inspired by these plans, the hike, and my new found stone collection.